Step 1. Choose and arrange a selection of threading beads to plan out the design of your Key Chain Pendant. Step 2. Using Posca Ultra Fine Point Markers, draw patterns of lines, dots and shapes on some of the beads. Set aside to dry. Step 3. Cut a 40cm length of ribbon. Fold in half around a split ring and loosely fix with a knot. Step 4. Create an aglet by wrapping clear tape around the ends of the ribbon to form a tapered point; this makes it easier to feed the ribbon through the beads. Step 5. Thread the beads onto the ribbon. At the base of your threaded design make several knots (over the top each other) to hold the beads in place. Options. Add a key chain to the split ring. 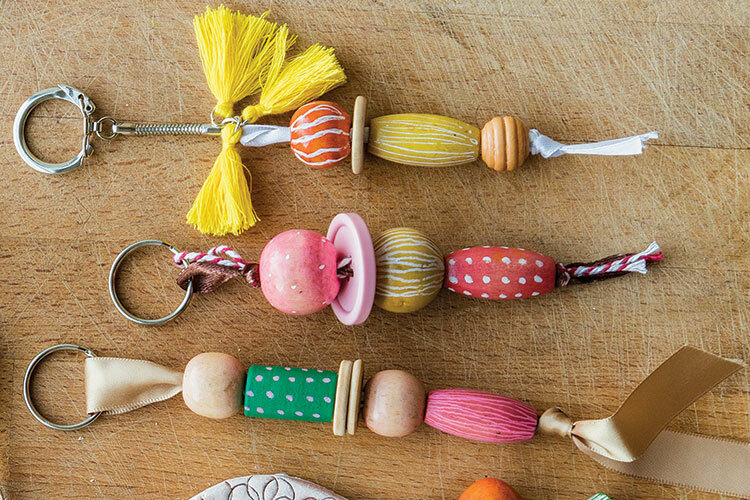 Explore using ribbons and threads, add tassels and found trinkets to personalise your pendant.